A game cart can make taking your hunting trophy back home quick, easy, and help reduce potential back strain from hauling larger animals out of the woods. 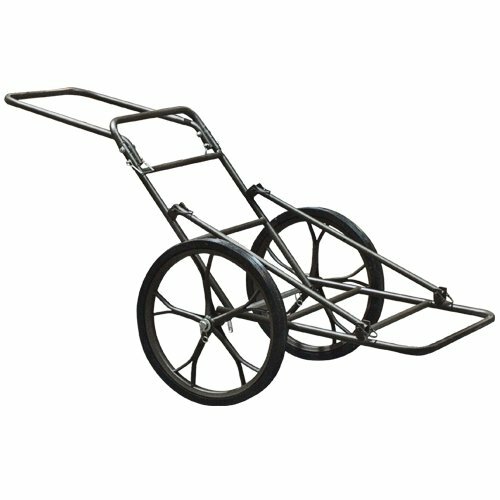 A hunting cart can be either sled-shaped in design and meant for use in colder, snowier climates, or can be a wheeled cart device much like a shipping wheeled dolly, which is primarily used for transporting large animals over more flat terrain. The main things to consider when looking for a good large game cart is the size of the device, the portability of the cart itself, and the easy of use. While a large game cart is made to carry a heavy animal long distances without breaking down or falling apart, it still should be built in such a way so that it can fit comfortably in the back of a truck without taking up too much space. 【Solid Construction】Goplus steel construction hunting hauler cart weighing up to 500 lbs, perfect for moving big trophy game. 【Heavy-duty Steel Axle】17" Wheels Diameter,1.5" Rubber Tire Thickness, provide the game cart enough support to move in the wild outdoors. 【Large Space】69.3" x 18.1" Overall Dimension provides plenty of room for carrying games and hunting equipment. 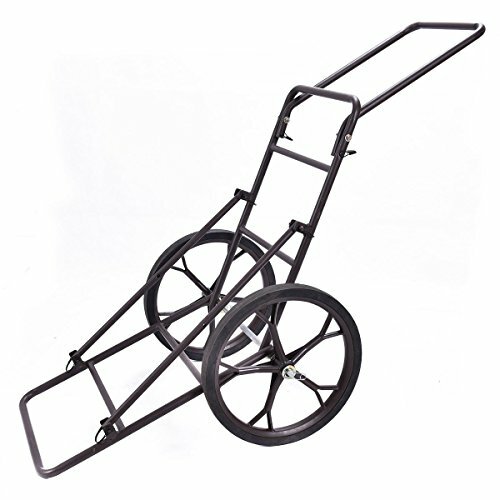 【Foldable Design】This Deer Game Cart can be easy folded, convenient to carry or storage. And assembly is quite easy, can be finished in a few minutes in outdoors. 【100% Warranty】We offer you 100% risk-free satisfaction guarantee to let you buy with confidence. We are quite sure that you will be super-impressed with DURABILITY, large Capacity and HIGH QUALITY of our Deer Game Cart. Most game carts are made of metal rods that allow them to be collapsible and easy to store. For the more simple game sleds, they come in a compact design with cross ties to allow you to keep your trophy secure for a long distance without having to worry about dislodging the animal. 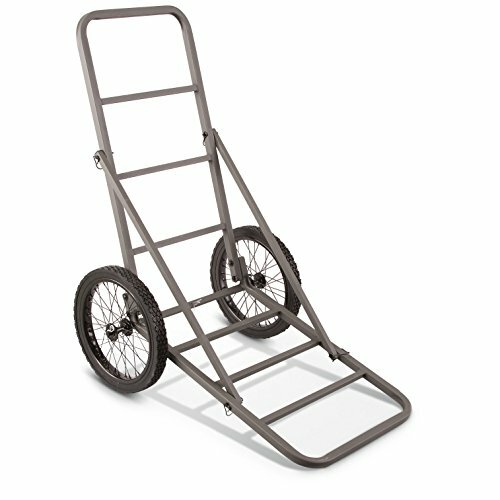 A large wheeled game cart can help move an up to 500lb trophy animal, making it crucial that your hunting game cart is sturdy and durable on top of easy to move. Doing your research on the carry capabilities of a wide range of game carts, as well as checking to see which carts work best for long periods of time, can help ensure that your investment lasts for years to come. Most metal game carts come with replaceable rough-terrain wheels to allow you to easily transport heavy loads back to civilization, and are ideal for moving your trophy from one location to another for tagging, cleaning, or taxidermy work. 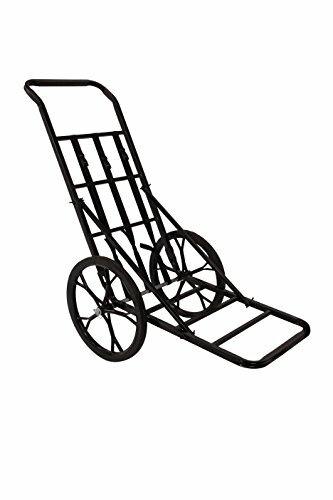 A good hunting game cart is easy to transport, and will keep your game secured over bumpy terrain. A good game cart can also help reduce the chance of you damaging your game or yourself during transport, as it can take some of the weight off of you when it comes to trying to transport heavy game. When looking for a large game cart, making sure you figure out what kind of cart you are looking to invest in is key to getting the most out of your purchase. If you find yourself hunting most often in the colder months of the year, in snowy conditions, or are looking for a game carrier to help you move medium to large game, a hunting game sled may be more ideal for your needs. 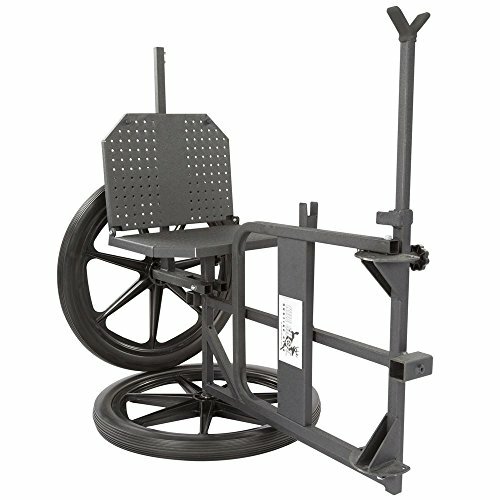 However, if you are interested in transporting large game earlier in the season, a wheeled game cart may be perfect for you. While a game cart can be a larger investment item, it can help you transport your game over a long distance without putting additional stress on you or your prize, and can help streamline the processing step of your hunting trip.